This one show featured one of the most interesting setlists of the tour: absence of Will I Dream was more than compensated by one of the two performances of War on Drugs this tour, and a blast from the no-so-distant past -- full speed Anaconda. First and Last and Always and Vision Thing were also missing, but this was compensated by Gilmour/Waters/Marx/Eldo number, quite rare these days. Too bad people visiting the gig had to choose between it and the neighborhooding Coachella festival - this one featured quite a few electronic celebrities, such as Fat Boy Slim, Chemical Brothers, Underworld and others. Oh, and there were tables, too. And the table tickets featured obligatory dinner clause -- USA brand of rock'n'roll. Now for my third night. The Sisters invade the Sun Theatre in Anaheim California. The doors would open up at 6:00, with a dinner seating arrangement in the works. I was feeling completely haggard on this night. Especially after spending the entire day at Universal Studios. I think I was severely influenced by the Velociraptor like creature on the tour shirt. Anyway, I sat down and ordered the jumbo sized nachos with ice-tea. This would be my dinner, and about all I could handle. I could hardly wait for Tube to hit the stage and kick this show into gear. But when Tube finally started, I had found my way back outside to the cozy confines of a lawn. I listened to Tube from a far, one more time, just waiting for the Sisters to once again take over. Tube was short - enter Sisters. They would once again crank the night off with Ribbons, and it was all systems go from there. This would be a different set list from the nights before. Insert the dazzling War on Drugs, the speed demon Anaconda and the classic cover of Comfortably Numb. Very touchy stuff. The only noticeable exit would be Vision Thing, which has become an awesome encore number. But all in all, a better set list. All the new songs were on the go tonight. Even the house lights coming on three songs into the show, couldn't slow this night down. The venue was fairly packed, while competing with a neighboring arts and crafts festival called Coachella festival. Spiritualized and Underworld be damned. The Sisters of Mercy were once again playing it hard! The whole set was a spirited affair. While hearing Comfortably Numb played live for just my third time I really had a chance to enjoy the mood of the song. Adams back up singing really takes this song into another dimension. His guitar would be phenomenal on this night. Mike was still Mike, playing it hard and energetic forever and ever. Andrew would go through all the clothes again. There was a Motörhead t-shirt somewhere in there, with a very cool looking neon number, that looked like neon on neon. Hell, I even got in the spirit on this night. I showed up wearing my short sleeve neon t-shirt, and felt like part of the show. There would again be two encores, which suits me just dandy. The show finally had to close though, and I would be headed for a long drive home. By the time I got out of Anaheim, I was thoroughly spent. But, it was well worth another thumbs up gig. This review is a collaborative effort by two fans who attended this show in hopes of presenting a more reliable description of the events. Redman, who attended both Anaheim and Los Angeles shows remembers the Anaheim show being better than the San Francisco show, and comparing notes with others who were at the San Francisco show, it seems a safe assertion. The first noticeable difference was the change in set list. The second departure for the evening's performance was the lighting problem. Sometime during either "Detonation Boulevard" or "Come Together" what appeared to be fire lights went on, though we were fortunate enough to not have an automated sprinkler system turn on. The band continued on with the song without flaw and went into the next, but the technical difficulty, while largely cutting out the on-going light show immediately started to add an element of interaction between the band and the audience. While from the seats behind the pit area began to emerge sounds of disgruntlement at the lights either canceling the light show, or more likely for killing the dark atmosphere for the goths, for those of us in the pit, it was a bonus. While at first the band seemed put out with the difficulty, as they were bombarded from those of us in the 'pit' with our looks of enjoyment and attitude of 'well, if before we were of the impression that you performed for the first five rows, now you have no choice but to see us' and looks of dismay at the loss of show from the majority still at their tables, there seemed to form a sort of temporary comradery for the plans gone awry. After the first song fully played with the lights on was done, as well as corresponding sign communication between Eldritch and the sound station, Eldritch looked up towards the lights while shrugging, still defiantly holding the smoking cigarette he had walked on with, looked back down at us and said something about believing a smoke alarm had been set off and something like 'it's amazing the difference a cigarette can make'. Of course, by that time his had not been the only lit cigarette (nor the only variety), but the execution of the timely joke elicited a number of chuckles from the pit. In good spirits, the band hit into the next number. Two songs later and the problem still not solved he again addressed the audience saying something about how this wished they could wait until the problem was solved because of their light show, but also explaining there was a curfew and 'if we [waited until the lighting problem's fixed] then there'd only be half a set and that wouldn't be any good for anybody'. It was sometime between 'War on Drugs' and the end of 'Bei Mir Bist Du Shoen' that the lights finally went back off. It is Orcadi's opinion that the lighting problem made the show. When the lights came on and forced the band to acknowledge their audience, see the audiences' reactions and then the band and audience start reacting off each other... it was the exact sort of show he needed to counter-act a particularly bad week. Redman recollects that during the beginning of 'Romeo Down' Eldritch came over to the right side of the stage and was bouncing there for a long while, later returning during 'Some Kind of Stranger'. Redman wants to advise fellow fans that Eldritch seems to like the right side of the stage better, since for most of the shows Redman has seen, Eldritch seems to favor that side. In the end, the show was aptly described by the words on everyone's lips: "Great show!" Well, after seeing the sisters on Monday in Denver and then having to work all week I was really jazzed to see them on Friday and Saturday in LA. Overall the best show was the Anaheim show, probably because it was such a trip - sit-down dining at a SOM show... something perverse about that. Then the fire lights lit up because of the smoke... oh yeah, and the spectacular seating - the very first row of seats in the dining area - about 15 feet from the stage. What of all this... am I a better person with love and compassion for all things great and small??? Well... not really, I just totally enjoyed three absolutely excellent performances by Andy and the boys. Can't wait for them next year. 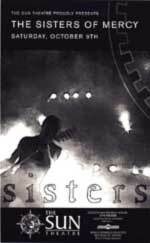 Ahhh - Let the anticipation begin for the next round of Sisters Shows!!! Handbill scanned by Christer Andersson (christe@nada.kth.se).